Slap the alarm at 5:45. Wake up to the snooze alarm at 6:00. Scald myself awake in the shower, cobble together coffee, breakfast and (if I’m lucky) lunch, and get on the road by 6:40 (on a good day). Arrive at school between 7:00 and 7:10, which is ludicrous; a seven mile drive should NOT take twenty to thirty minutes (for ridiculous theories about the causes of said traffic, turn your attention to this genius yelp conversation). Students begin to trickle in and out with various needs until the first bell at 7:30. That begins a cycle of four back-to-back periods of Advanced Placement seniors, most of whom are so far into the doldrums of senioritis that their year is looking less like a slide and more like an avalanche. Period four ends at lunchtime – a very early 11:10 for a highschool teacher – after which there are two period of “prep” for the day. Lately, most of those two hour stints have been filled with trips to the counsellor’s offices to follow up on sliding seniors, copying, grading, planning, and otherwise wishing the school year would hurry up and end. The end-cap on my day is a final period of literature class, followed by 30 minutes if tutorial, during which teachers are to make themselves available to struggling, curious, needy or otherwise imposing young minds. Once the classroom finally clears, and assuming there are no scheduled after-school obligations, an hour is dedicated to preparing for the following day, grading essays, and avoiding the urge to sink helplessly into the semi-mindless void of TED Talk viewing. Finally hit the road around 4:00, rage through yet another infuriating bout of southbound 405 traffic, and either hit the gym for an hour, or head home to take the dog for a run. Finally get home, cool down (make sure the shower “takes”), shower, change and finally get into the kitchen, it’s usually somewhere around 6:30 – a solid 12 hours since the last visit to that wonderful room earlier in the day. Which means that unless we want to eat dinner at 8:00 at night, I need to come up with something delicious that can be executed quickly and efficiently. Thank god for grill, grocery stores, and instant rice. The following recipe emerged from just such a day, and I thought I’d share it with you, as it was easy to make, quick to cook, and packed a flavorful punch that could be enjoyed by all. Looks good, right? Don’t worry, it is. Get the chicken going first. This recipe could be used for any cut of chicken, but I use boneless breasts, because that’s what I usually stock. The Safeway value pack of said breasts is cheap and versatile, though probably full of “plumpers” (remember those commercials?). Given their size, I usually cut each piece into three equal “tenders” for a recipe like this. Peel the garlic (as I mentioned in an earlier post) and the ginger. 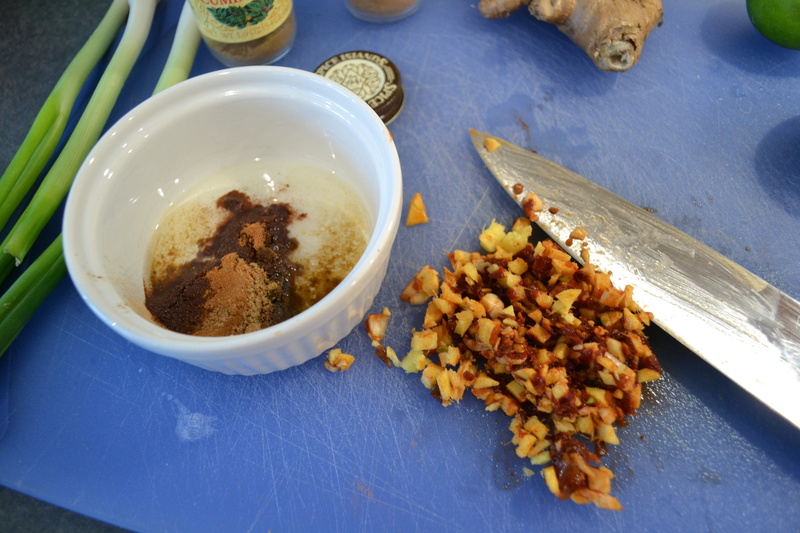 To peel ginger, I like to use a spoon to scrape away the skin (as demonstrated here). 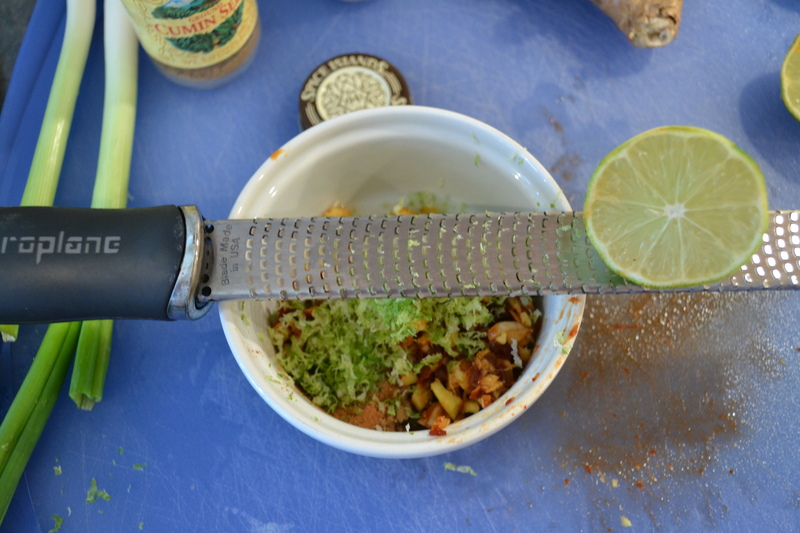 Pile the garlic, chili pepper, and ginger together on the cutting board, and mince them together. 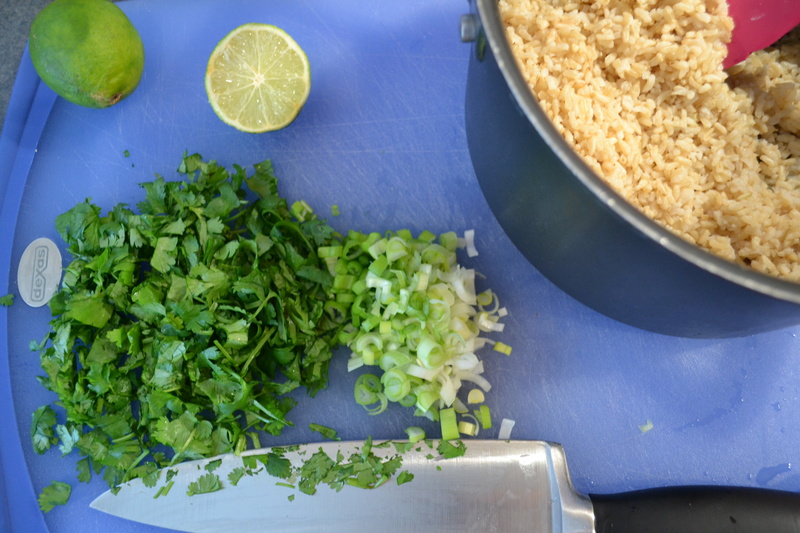 In a bowl, mix together those three minced ingredients, lime juice, lime zest, the adobo sauce, cumin, coriander, cinnamon, vegetable oil, and a pinch of salt and pepper. This will form a thin paste that’s half marinade, half rub. 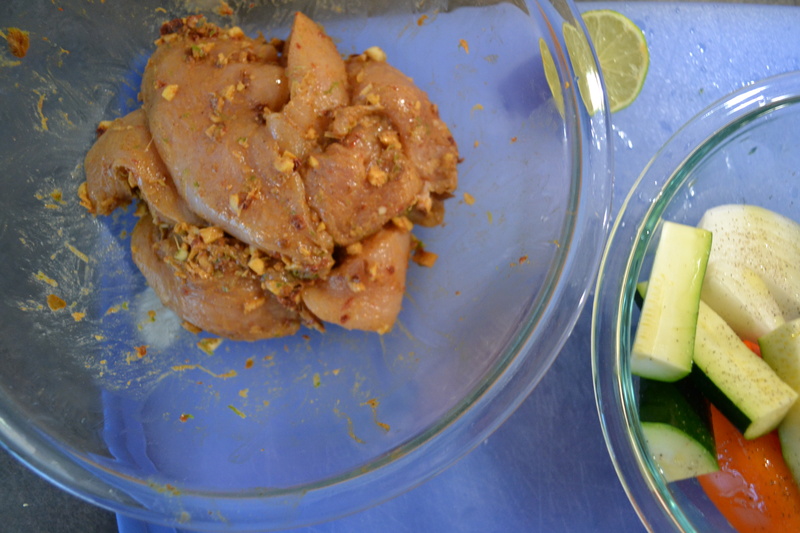 Place the six chicken “tenders” in a medium mixing bowl, and use your hands to mix them together with the spice marinade/rub/paste. Set aside until ready to grill. Cook the rice according to package instructions. For the instant brown rice that I prefer to use, this is about a 15 minute process, so it coincides well with the veggie and chicken cooking times. Preheat the grill over medium heat and coat the grates with olive oil or nonstick cooking spray. 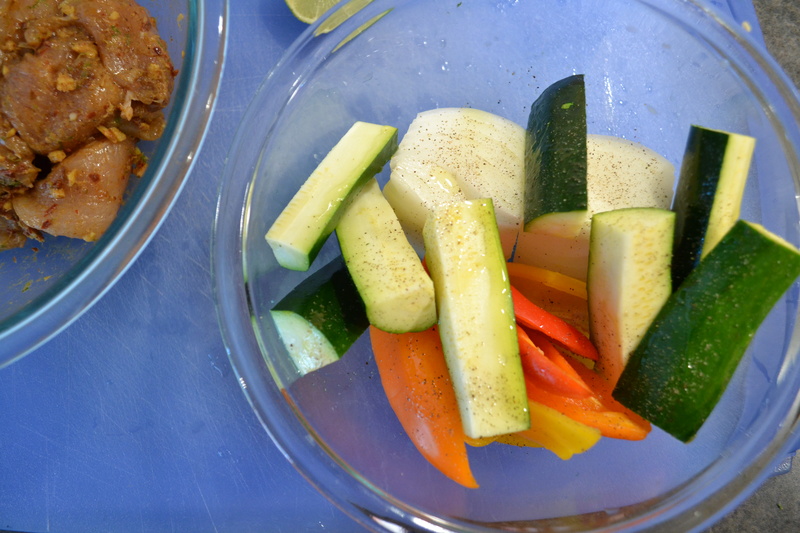 Cut the zucchini into spears, the mini sweet peppers in half (removing the tops and seeds) and the onion into quarters, and season with a pinch of salt and pepper, and a drizzle of olive oil. 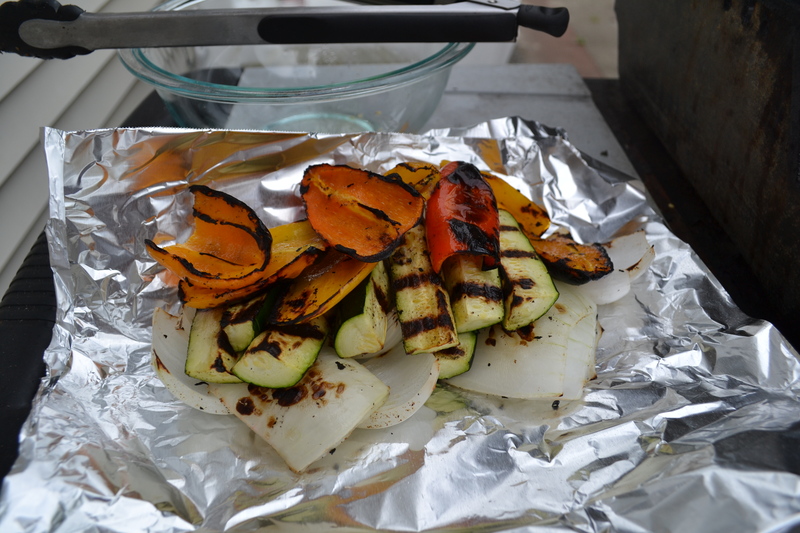 Begin by grilling the veggies over medium flames, turning them every three or four minutes. Make sure to grill the zucchini spears and onion quarters on each of their three sides, and the pepper halves on each side. 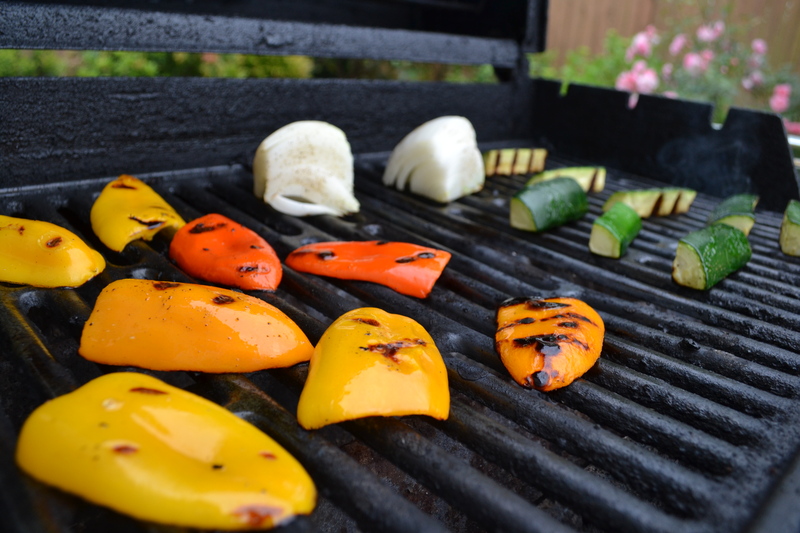 Remove the veggies to a grill tray or piece of aluminum foil, and place them on the less-heated side of the grill, or (as I do) in the awkward little basket swinging from the inside of the grill lid, so they continue to cook as you grill the chicken. After removing the veggies, turn the flames up to medium-high, and grill the marinated chicken tenders for 3-4 minutes on each side, turning only once. One of the worst things you can do when grilling something simple (like chicken breast) is to turn the meat multiple times. If you’re looking for the perfect grill marks, you have one opportunity – the first time the raw flesh hits the grill – and after that you’re just overcooking your bird. Remove the chicken and veggies from the grill, and allow both to rest for a few minutes as you prepare the rice. Yes, you can eat brown rice without adding any additional ingredients, but that’s boring. Prepare the rice just before serving. Add the butter, and fluff the prepared rice with a fork. 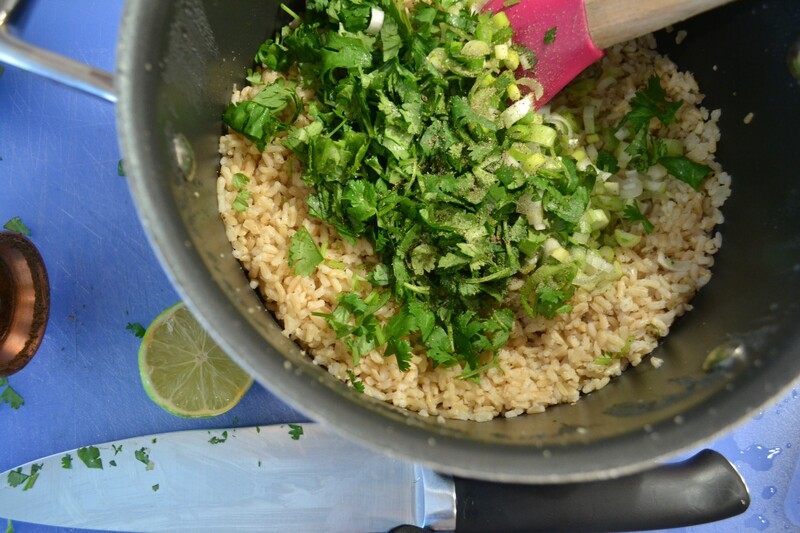 Once the butter is melted, add the onions, cilantro and lime juice to the vessel, and fold them into the rice. Sample the mixture, and season to taste. If you care about calories, leave out the butter. Arrange, serve, and enjoy (preferably with a cold brew)! 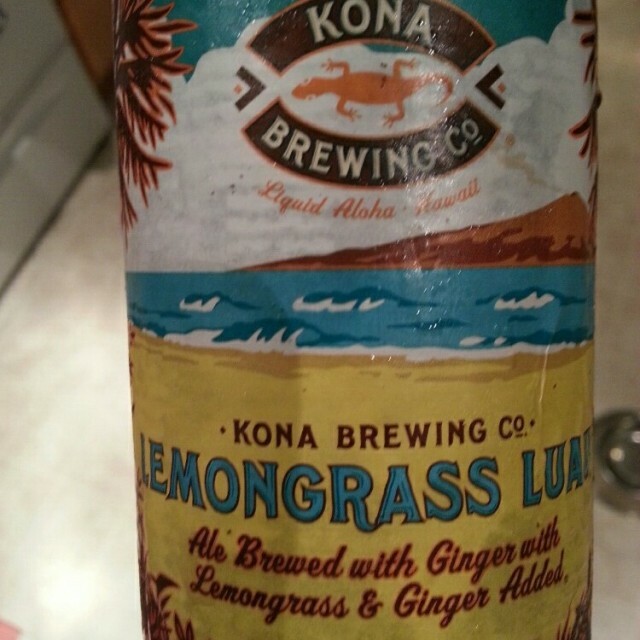 As a tasting note, this would pair well with Kona Brewing’s Lemongrass Luau. 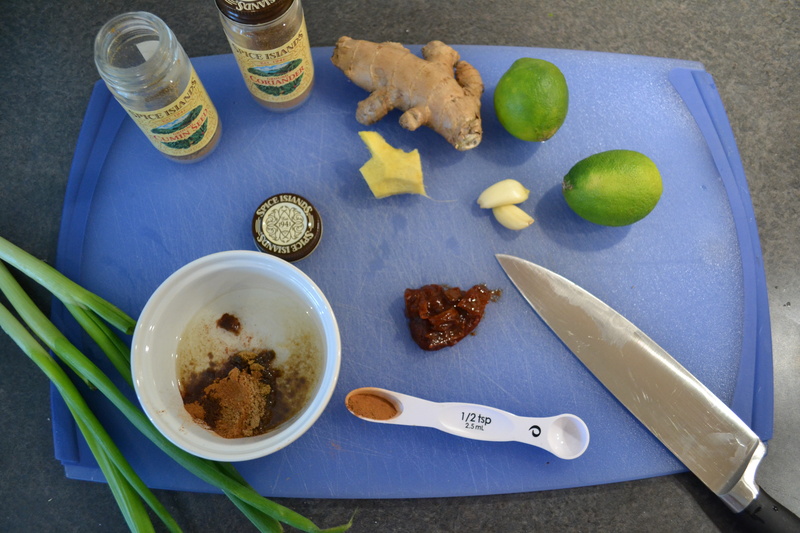 This beer is a simple, light(er) ale brewed with (you guessed it) lemongrass and ginger. 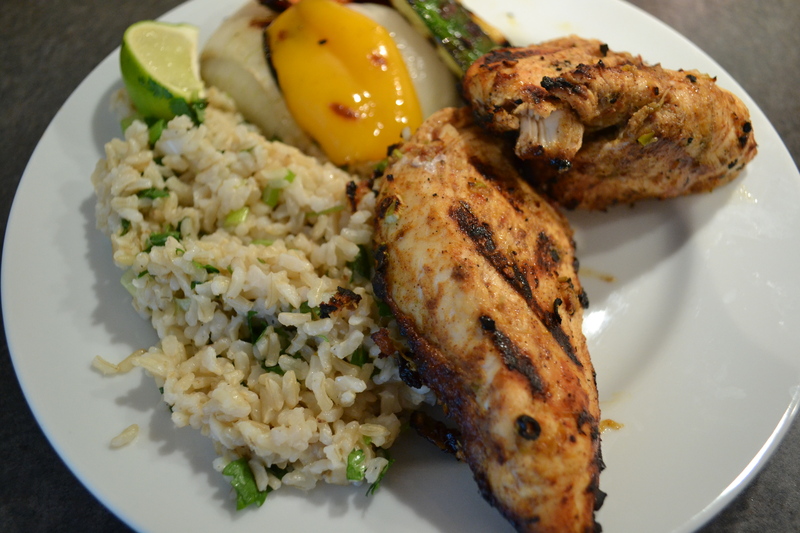 As such, it is light and refreshing and has a sweet and spicy flavor that would work perfectly with the layers of chipotle spice, gingery sweetness and citrusy zip that come through zesty chicken and rice. Make sure to check out the real food recipe roundup hosted by Jo-Lynn and Sassy Moms, especially if you’d like to find some excellent recipes! Previous Entry I Love Avocado Pesto!